Designing wedding invitations with MYSELF as a client was probably one of the hardest things I've ever done. I've designed so many invites via Orange Paper Shoppe this past year, but sitting down to make invites for my OWN wedding was very challenging, I'm a tough customer. I always wanted to letterpress my invitations, but Brent convinced me that they would be just as good if I made & printed them myself. Once he convinced me, I got to work hand-lettering the main invite and rsvp card. I made mini postcards using a few of my favorites from my vintage postcard collection. On the back of these I printed all of our wedding info for our guests (hotel accommodations, registry info. etc. ), which fit into these mini white envelopes. 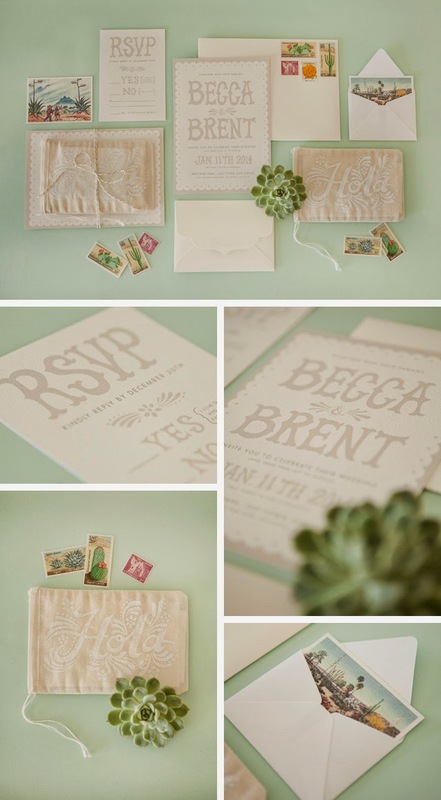 We had an all-white, fiesta themed wedding in Old Town San Diego, so I stuck with a lighter white on white color palette and used these AMAZING vintage cactus stamps (found here on Etsy) and vintage cactus postcards to bring that fiesta flair. My favorite part of these invites were the Hola bags I hired my super talented friends at Hecho Por Sego to illustrate and screen print for me. These little bags secured the rsvp cards and mini envelopes with all the wedding info, and I tied them all together with metallic and white twine. They were a ton of work, but in the end I was really happy with how they turned out and think they did a great job setting the tone for our wedding. I'll be sharing more pictures from the big day soon! I guess being a tough costumer paid off. Haha! Your wedding invitation is quite lovely! This is the benefit of getting involved so deeply with the process of designing and creating it; you can get your finished product done as fine as you wanted them to be. Cheers!